In May, The Fuller Center for Housing was one of 114 new Bicycle Friendly Businesses announced by the League. Among the many merits that earned this 13-person nonprofit in Americus, GA, the Silver BFB award was their annual Fuller Center Bicycle Adventure — a cross-country fundraising ride to help build and repair houses. What are the tools you need to build a house? If you're like most people, you probably think of tools like a hammer, ladder and saws. At The Fuller Center for Housing, we have built or repaired almost 5,000 homes for 20,000 people who needed a hand-up around the country and the world. Yet, in our experience, one of the most important tools has proven to be one that's not sold in most hardware stores — the good old-fashioned bicycle. How does a bicycle help to build a home? After all, most cyclists don't think of nails too fondly, at least when they're pulling them out of their tires. But the beauty and simplicity of traveling by bicycle has a way of creating positive effects beyond the obvious. Friendships are formed. Faraway places are suddenly connected. Inspiration fills the air. Enter the Fuller Center Bicycle Adventure. Think of it as a cycling event on steroids … okay, bad analogy! Then think of it as a series of very long-distance bike rides in which strangers — and returning friends — from around the country and even internationally tackle a tremendous challenge by supporting each other in a team-first environment. 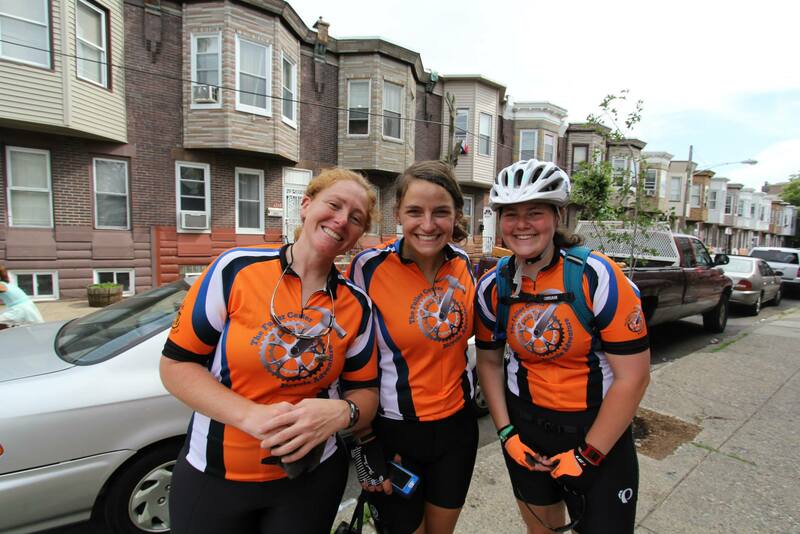 Each rider solicits pledges and must meet a required fundraising minimum, of which about 98 percent goes to support the Fuller Center's work rather than ride costs thanks to sponsorships, the modest registration fee, and the generosity of host churches along the way. Over $2 million has been raised through the Bike Adventures. Yet, the relevance to housing ministry is much larger than the dollars we raise because of the unique operating structure of the Fuller Center. The Fuller Center works in over 70 U.S. cities, 19 other countries and Puerto Rico. Most organizations of similar girth rely upon a strong brand presence, layers of costly professional staff, big-name celebrity backers and a steady supply of funding from foundations or government. In addition, the poor whom many nonprofits serve are too often depicted as needy or helpless. Not at the Fuller Center. The Fuller Center was founded to be a different type of organization. We're a series of partnerships. 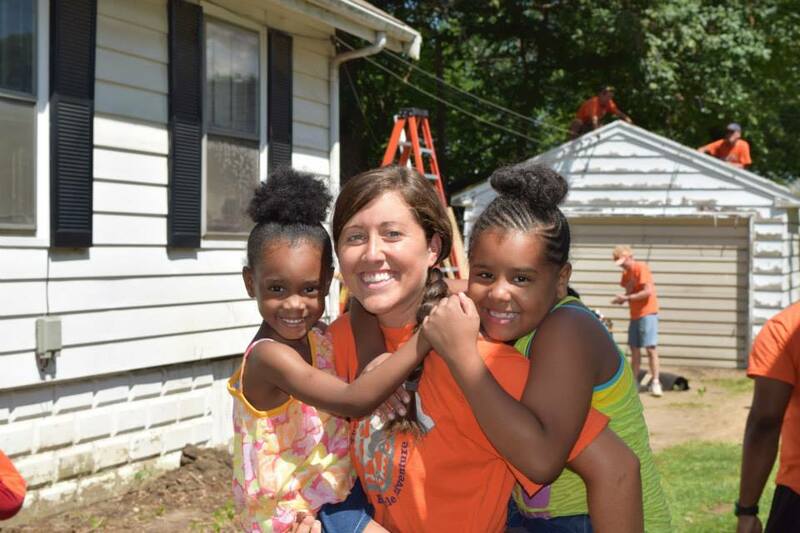 The families with whom we build or repair homes are called partner families, and they help with the work and pay it forward on a no-profit, no-interest basis. Very grassroots, our local chapters are termed Fuller Center Covenant Partners rather than affiliates or franchises. Most Fuller Centers are entirely run by volunteers without staff. Financially we're heavily reliant upon the generosity of thousands of individuals and churches who generally make very modest-sized gifts. We're a bit short on celebrity endorsements. So what makes it all go? In a word: passion — that fire in the belly of our volunteers that makes them stay up late organizing a local build in their home area or getting a group together to go build in a place like Haiti. But passion, which is fueled by inspiration, must start somewhere. For many of our riders, that somewhere is the Bike Adventures. Most of those who join our rides do not do so because of passion for the mission — at least not the first time. They join for the adventure or perhaps the love of cycling. Then, whether a young college student or a retiree, it is the experience of the ride that kindles the passion for our mission. How so? We live simply as we go, remembering those around the world who live on so much less. We stay in churches and are amazed at their hospitality — especially their cooking! We conquer immense challenges together, supporting our new friends like they are our family. When the rides end, we're usually more than a little happy to be done spinning our legs for a while, but the passion for the mission remains. Riders go on to start a Fuller Center in their local area, join one of the Fuller Center's Global Builders trips around the world, put us in their will or just come back again the next year with a newfound reason for doing so. Most of all, they become our friends and ambassadors all over the country. The Bike Adventure experience inspires, builds connections and friendships, sparks passion, and raises money — proving to be exactly the tool that the Fuller Center needs to build and repair homes. 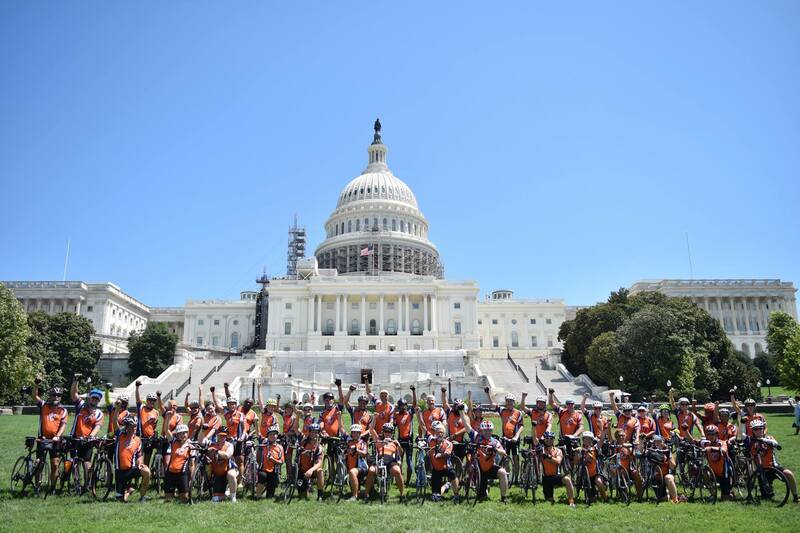 While the Fuller Center Bike Adventure started as a way to support the organization, as it grew the reverse started happening as well: the organization started supporting cycling. It all happened organically — the rides started attracting young talent to serve as long-term volunteers or staff at our headquarters in small-town Americus, Georgia. Other staff then came out to participate in the rides, even if for just a bit, which got them back onto bikes they had not ridden for years. Some of those staff created a simple Facebook group called Sumter Cycling, named after the county where we're based, as a way to find others with whom to ride to prepare for the Bike Adventures. A few years later in 2012 that led to the legal creation of Sumter Cycling as a local cycling advocacy and riding organization that is flourishing to this day. Fuller Center staff have been a constant presence on its Board of Directors, including as its President for three years. At our modest headquarters, several of our staff bike commute each day, including a member of the senior leadership team, and our President David Snell has been known to ride on Bike to Work Day. Covered bike parking is right outside our windows, and bike gear and parts are a constant presence in the office. Our now-substantial cycling know-how and cycling support equipment have been terrifically helpful to Sumter Cycling. We have designed, ordered and sometimes sponsored Sumter Cycling bicycle jerseys, put up cycling awareness signs on our lawn, helped create Sumter Cycling's website, and our Bike Adventure Director Connor Ciment even fixed up dozens of old bikes to give away to local children. In short, cycling is now in our organizational DNA, and we were proud to recently receive recognition as a Silver Level Bicycle Friendly Business. Dirt to D.C. (September 14 - 23, 2018) -- our 2nd annual trek down the historic and unpaved bicycle trail from Pittsburgh to Washington, D.C. and includes a free van ride back to the starting point. Natchez Trace Parkway (April 5 - 14, 2019) -- our 8th annual ride down this beautiful paved bicycle route that ESPN rated as one of America's ten best biking roads. It goes from Nashville, TN to Natchez, MS with a free van ride back to the starting point. 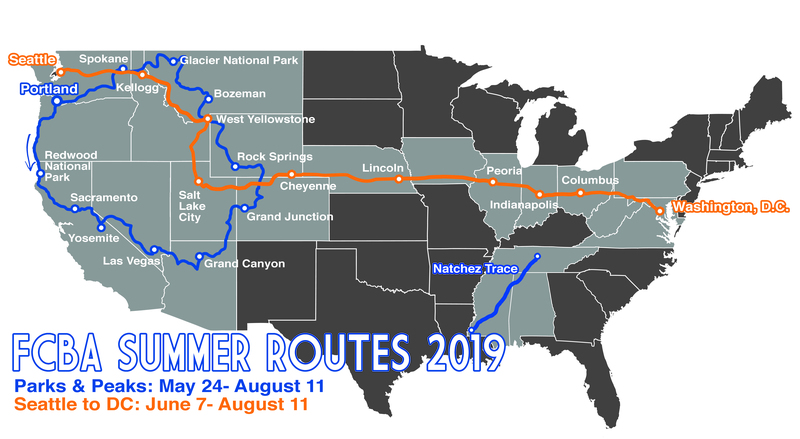 Parks and Peaks (Summer 2019) -- an 11-week loop visiting Yosemite, the Grand Canyon, Yellowstone, and five other National Parks as well as countless other stunningly beautiful sites in 10 western states. Join for the whole way or any of the week-long segments. Washington to Washington (Summer 2019) -- ride 9 weeks across the country through 15 states from Seattle to D.C., having the chance to see the whole country on the trip of a lifetime. Join for the whole way or any of the week-long segments. Ryan Iafigliola is the Director of International Field Operations for The Fuller Center for Housing, and the founder of its Bicycle Adventure program. He welcomes notes of feedback or interest at bike@fullercenter.org.